A few years ago I was interviewed for this documentary “The Principle” that was to challenge the idea that the Cosmological Principle was wrong. That much I agreed with and still do. The planet Earth is in a special place in the Universe, which is not the same thing as being absolutely geocentric. The documentary includes interviews largely with professional PhD physicists and one theologian. I agreed to be interviewed because I believed that this subject needed to be debated and I wanted to present a biblical creationist non-geocentric point of view, which still permits our planet Earth to be in a special place in the Universe. That does not mean that it is stationary and that it is in the unique centre of the cosmos. See The Cosmological Principle and geocentrism for my opinion on geocentrism. At the time I agreed to be interviewed, I did know that the producers were geocentrists but they assured me they would present a balanced debate, where all sides were aired. Actually, I wanted to help because, maybe naïvely, I believed it could get a good strike against the cosmological principle dominating paradigm. I have just now watched the complete final released version of the film, twice, and make the following comments. It is well produced and entertaining. The interviews provided generally present the scientists at their best and in terms of content, and the discussion is provocative. That is, they state their feelings and beliefs, which are often contradictory among them. In that sense the film is quite upbeat and technically very well illustrated, directed and edited. It is an interesting topic that is difficult to present to a lay audience. Scientific terms used are explained and I think the producers have done a good job on that, though, I think, the audience should be intelligent and have at least some knowledge of the subject. These two statements can’t both be right. Nonetheless Rick deLano advised me (by email) in December 2013 that they would drop using “irrefutable proof” language in their marketing, which I can only hope they did. Also they said they would not attribute to me that which I have not said. So to be fair I have watched the film through twice; the second time really analysing everything. The film provides opinions, which are interpretations on observational evidence, about the Universe we live in. Whether or not we find Earth in a special place, in an exact spatial sense, as compared to in any other sense, like the favour of God, His providence for mankind, or even spatially, but only cosmologically somewhere near the centre of the visible universe, that is a different matter. The movie interviews 11 others besides myself. They include leading physicists in their fields, Max Tegmark, Lawrence Krauss, Michio Kaku, Julian Barbour, Bernard Carr and George F.R. Ellis. Those interviewed can be summarised as 6 (Tegmark, Krauss, Kaku, Barbour, Carr, Ellis2) holding acentrist worldviews (believing no special place, nor centre in the Universe, the standard big bang cosmological position), 3 (Robert Sungenis, Robert Bennett, Martin Selbrede) holding a geocentrist worldview (believing that the Earth is at the absolute unique centre of the universe, and it is stationary while the Universe rotates around Earth), Ronald Hatch (a Christian, believes in a Creator, rejects Copernican principle,3 an anti-relativist with his own gravity theory4), myself (a biblical creationist with a (near) galactocentric worldview, a believer in modern physics including special and general relativity) and John Byl, a mathematician, a Christian,5 possibly a creationist. I don’t know much about his cosmological worldview. From this film I conclude he is anti-big bang but from a presentation he gave,6 I can conclude that he does not read the creationist literature he is citing, and ostensibly explaining. My overall impression is that the producers intended to create, and did effectively achieve, a conflict between the acentrists (atheist/no Creator/cosmological and Copernican principle/no special place believers) and the geocentrists (a Creator/anti-cosmological and Copernican principle/special place believers). They also predict a future with the scientific world coming back to its senses and placing Earth at the absolute centre of the universe, again. That is, the earth is put back where it belongs. An uneducated lay audience could well be awed by the implication that evidence points to Earth being in a special place (which I don’t disagree with) but they may incorrectly interpret that an absolute geocentric universe is the only other choice. The film is about 96 minutes long including credits. Up to the 45:00 minute mark there was not a single suggestion of any choice other than either an acentric or a geocentric worldview. Beginning of animation sequence flying out from Earth. Though the data I present on the large-scale structure is discussed and well animated, the way it is presented could lead a viewer to think that it implies the Earth is located at some absolute centre.8 I did not say that but neither do I claim here that the film says I said that. At the 50:58 mark as I am discussing the large-scale structure, the animation places the Earth at the centre of that structure, which might leave the viewer with the wrong impression. Then at 52:28 mark it does exactly the same thing again. But I said ‘galaxy’ so it would have been better use use an image of a galaxy. 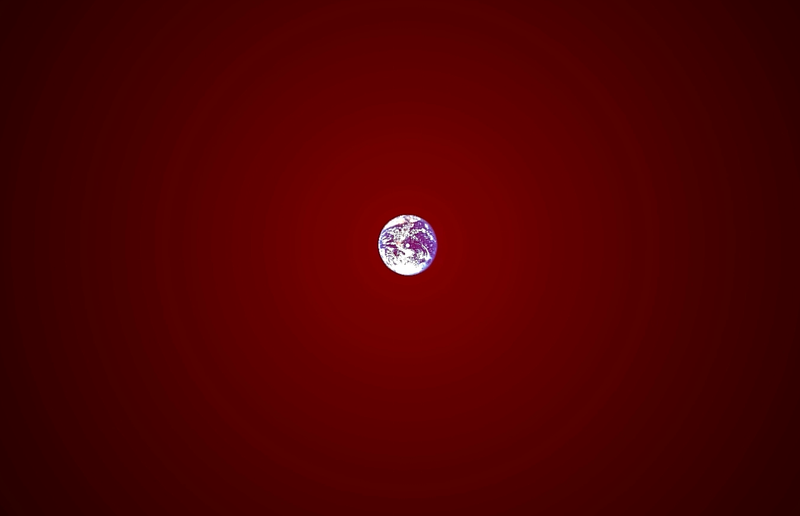 There are several other occasions where the voiceover gives the impression of Earth-centred when in fact the evidence suggests nothing more than the Earth being somewhere cosmologically near the centre of the Universe we see around us. That means that on the massive scale of the distances in the Universe, our galaxy could be somewhere near the centre. I am talking about God placing our galaxy in a special place. I explained my opinion and I used language along the lines of the Earth placed here to see the glories of God all around us. I explained to them evidence that could be interpreted in support of a galactocentric universe where Earth is cosmologically near the centre of a massive superstructure of galaxies, i.e. cosmologically (within a 100 million light-years) near the centre of the visible universe. Also I explained the same evidence could be interpreted as an indication of oscillations in the expansion rate of the universe and those galaxies located on concentric shells in redshift space may not be representative of real space, though I would like very much for that to be the case. See Our Galaxy near the centre of concentric spherical shells of galaxies for a full explanation. Producers deLano and Sungenis read my (Hartnett & Hirano 2008) paper.7 We discussed it and they wanted me to talk about it on camera, which I did. 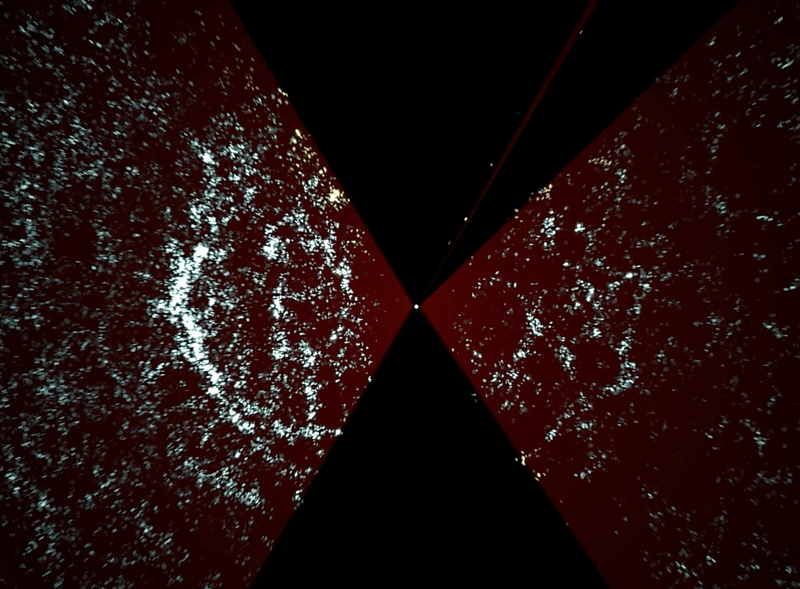 Large scale galaxy distribution from the Sloan Digital Sky Survey starting to be seen in the animation sequence. Note Earth at centre, which should only be relevant because the observations were taken from there. It does not imply it is in the absolute centre. I did not state anything about Earth at an absolute centre. After the animation (53:15 mark) of the universe showing concentric shells of galaxies, derived from my analysis of large scale structure in two large galaxy surveys, used to imply the concentric shells are centred on the Earth, Sungenis is cut in with his claim that this is evidence for an absolute geocentric universe. He says “So every phenomenon that you see out there is all on concentric shells around where? The Earth.” Then at the 53:21 mark a picture of the planet Earth is shown, reinforcing the wrong idea. But, thankfully, John Byl at 53:30 states that it’s the Galaxy in a special place not the Earth. The ‘onion’ illustration was my idea. I am sure I explained I was not suggesting the shells were centred precisely on the Earth? But that did not survive the editor’s cut. I think the viewer would be hard pressed to exactly know what my view is from the little that remains of what I did say in this precise regards. In some cases, context was lost. But most of what the scientists say in the film are either factually correct or opinions and interpretations they hold. But there are some errors. In the film (1:01:08) Sungenis says “…the whole cosmic microwave background is pointing to us, this tiny little point in space and this is where we live. ” He is referring to the ‘Axis of Evil’ in the CMB radiation anisotropies, though it is stated elsewhere it does not define a unique centre. It does not, nor does it point to Earth. It defines an axis in the cosmos, an anisotropy axis. That is a special direction. Tegmark says the same. But it does not point at the planet Earth. After that the impression is given of a conspiracy at NASA. Oh well, then it must be true. The voiceover says “there is the hint of something really big” at this point (1:06:50) with the animation illustrating again large-scale structure zooming into the Earth itself, not the Galaxy, or local galactic neighbourhood. The impression of geocentrism is being painted. Bernard Carr says, “We are talking about ultimate things here.” This is correct. It is about our place in the Universe, where the Earth is, a planet located in a quiet place in the Galaxy, in a prime location in the solar system, so that it can support life. It is also about the Anthropic Principle, or the Goldilock’s universe (a ‘just right’ universe from the atheist and/or multiverse believer perspective). That is, that the constants of nature are so finely tuned that life can exist. Of course the atheist says, we are not significant because we live in the one universe of a quadrillion universes in the multiverse that just happened to have all the right parameters that allowed life to evolve. Hence we are here to debate this. But that, as the film elicits, is just the ‘back door’ for those who reject the Creator. So, yes, the Earth is in a special place. But that statement does not mean its geocentric, fixed in space, with the rest of the Universe revolving around us. The arguments will continue no doubt, the acentrists will continue with a godless universe while the geocentrists will continue to claim scriptural support for an immovable earth. In my opinion, both are wrong. And, after watching the film twice through, I was not convinced to change that opinion. In the film the bias of the producers had to show through even if they did not intend it to do so. Both are strong geocentrists and it does show through. In my opinion, George F.R. Ellis is an equivocating theist. Footnote added 24/2/15: In my analysis of the large-scale structure of the Universe all measurements rely on redshift as measured from the earth (often converted into heliocentric co-ordinates) so the animation at this point in the film is technically correct showing the earth at the centre because the observations are taken from there. This by itself in no way implies the earth at the centre of the Universe, because all measurements are in a radial direction from the earth and it tends to bias the observers location. The bullseye effect and the finger-of-God effect are two direct results of Doppler motion which would be incorrectly interpreted as structure of galaxies pointing back at the earth. However what I saw were concentric shells of galaxies in redshift space as shown in the animation. Whether or not these shell are centred on the earth in real space requires some assumptions and interpretation of the evidence. I told the Producer at the time of my interview that I was still working on seeing if we could validate whether the near galactocentric structure could be verified, as a real space effect, after further more rigorous analysis. That work has taken some time and it is not yet complete. Once certain assumptions are made about the Universe, allowing for what we can’t see and cosmic variance, the result may well be that we can’t conclude that it is real space cosmic structure. It may only be a redshift space effect. We’ll see when the research is finished.